In the high-poverty communities we serve, many of our students experience challenges and traumas, which is why our support of their healthy development takes many forms. It’s a joint effort that unites school staff, City Connects coordinators, families, and community partners, so that every child gets a network of support tailored to meet their needs. Part of the role of our coordinators is to use their training as social workers or school counselors to discern who could benefit from more opportunities to build social-emotional skills and relationships to better manage their emotions, and who could benefit from more intensive mental health services to help them be ready to learn. Once coordinators make this determination, they spring into action. They do regular check-ins with students and families going through tough times. They find community partners who can provide mental health services, including one-on-one counseling. They run social skills groups. And they support teachers and other school staff find productive ways to talk about and address students’ struggles. “Sometimes kids come to school angry,” Elise Bradley says. She is the coordinator at the P.A. Shaw Elementary School in Boston’s Dorchester community. And she’s seen that anger in students who are upset because they are homeless, hungry, or missing absent parents. “There was a lot of need for helping kids understand their emotions and find the language to express those feelings,” Bradley says of her early days at Shaw. Her goal was to bring in partners who could provide free or low-cost services. So she found programs that are paid by children’s health insurance providers. Today, South Bay Community Services provides counseling for individual students. And an organization called Wediko provides group counseling to any child dealing with grief or loss. This covers children who have moved from school to school and lost connections with old friends and teachers. It also includes children whose parents have been incarcerated or who have parents or other relatives who have died. “The group gives these kids an opportunity to realize that they’re not the only kid going through these difficulties. And it helps them with setting up a network of support,” Bradley says. Bradley also brought Doc Wayne into her school, a provider that “connects with youth through sports, utilizing our sports-based therapeutic curriculum,” the organization’s website says. At Shaw, Doc Wayne serves boys in first, second, and third grade. These students play soccer, basketball, and the recess game fish and minnows. It’s a fun, physically active way to learn about team building, conflict resolution, building confidence, and developing self-regulation. “It encourages creativity and helps these kids be kids,” Bradley says, which is especially important for kids who are dealing with adult-sized problems. 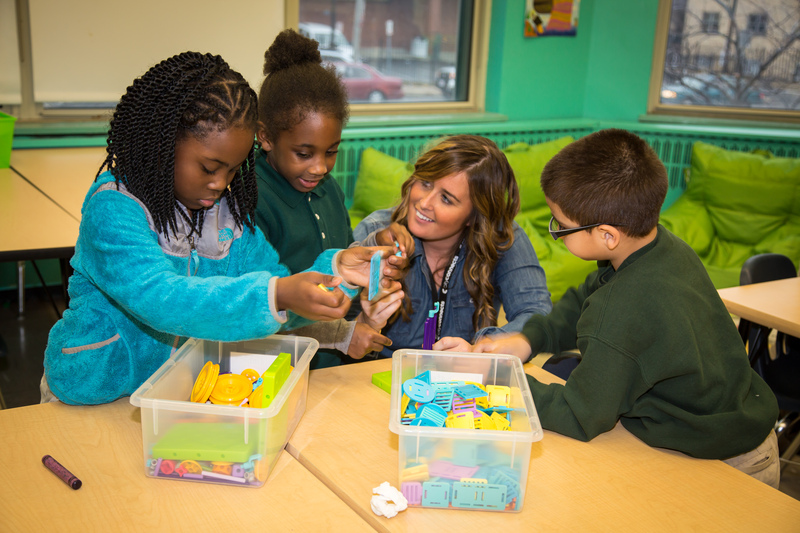 In Dayton, Ohio, City Connects Coordinator Adairia Kelly has also helped boost resources for addressing some of life’s challenges at her K-4 elementary school, DECA (Dayton Early College Academy). In heartbreaking cases, Kelly also knows the power of showing up, of attending a funeral for a parent and making eye contact with a student so that the student can literally see Kelly’s support. Kelly brought two mental health providers into her school. Eastway Behavioral Healthcare provides individual counseling; and Samaritan Behavioral Health runs small social skills groups that build on peer-to-peer relationships. Students learn how to listen and share and how to communicate effectively with adults even when the student is upset or disagrees with the adult. The impact of building a tailored network of support for every child? Students are able to de-escalate their own behavior, they learn to be resilient, and, best of all, they build relationships and social-emotional skills that help them learn and grow.